Hello! I’m Amy Fellner Dominy and I’m super excited to be the host of this section of the hunt. For those as new to this as I am: this bi-annual event was first organized by author Colleen Houck as a way to give readers a chance to gain access to exclusive bonus material from their favorite authors…and a chance to win some awesome prizes! On this hunt, you’ll get access to exclusive content from each author, and you also get a clue for the hunt. Add up the clues, and you can enter for the grand prize–one lucky winner will receive one book from each author on the hunt in my team! But play fast: this contest (and all the exclusive bonus material) will only be online for 120 hours! I write young adult, middle grade, and picture books. I live in the desert with rattlesnakes and scorpions. I wish they were as afraid of me as I am of them. My newest YA novel comes out IN LESS THAN A WEEK: The FALL of GRACE launches April 10th. Somewhere on this blog hop, I’ve shared a deleted scene from The FALL of GRACE that sparked the whole novel. A girl. A knife. Ashes. Well, you’ll see for yourself. OH–and one more special gift: In addition to all the books you can win on the HUNT, I’m giving away two fresh-off-the-presses copies of The FALL of GRACE. It’s suspense, adventure, action, romance and a road-trip all rolled into one fast read. And it’s out in just a few days!! Since you’re here because you love YA, I’d love for you to be one of the first to have a copy. You’ll find the Rafflecopter entry below. There are SIX contests going on simultaneously as well as a bonus contest and you can enter one or all! I am a part of the RED TEAM but there is also a GOLD TEAM, BLUE TEAM, ORANGE TEAM, PURPLE TEAM, & GREEN TEAM! Check out each team for a chance to win nine different sets of signed books! Go to the YA Scavenger Hunt page to learn more about the hunt, including links to all the authors participating, and see the full list of prizes up for grabs. Now that all the technical stuff is out of the way, I’ll introduce the author I’m hosting on this hunt. Julie Reece writes YA stories. Many inspired by life in the southeastern states where she grew up. She’s passionate about family, friends, animals, and underdogs, but bubble baths and dark chocolate make the list, too. 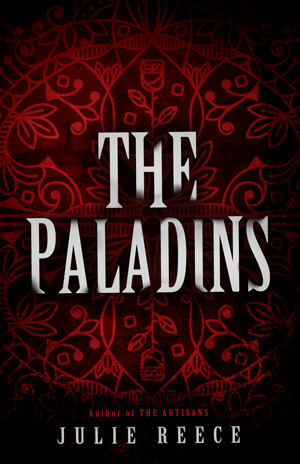 The Paladins completes this eerie YA Southern Gothic where loyalties are tested, love is challenged, and evil seeks them on the ultimate battlegrounds—their mind, soul, and heart. Hope you enjoy my picks. A young Christopher Mason (Brown) would be perfect to play Gideon Maddox. He could definitely play a brooding guy who is last in line to guard his family’s dangerous legacy. Wavy blond hair, full mouth and those mysterious eyes could be hiding a secret, don’t you think? Adelaide Kane would make an amazing Raven Weathersby. Long, dark hair against a creamy pale complexion is the right look, perfect for a southern gothic romance. Adelaide’s proven can play an unsure young girl stuck in terrible circumstances, as well as a badass. And somewhere in the middle of all of that are two guys creating plenty of drama. She’s perfect for the role. If actor Finn Wolfhard were a few years older, he’d be my first pick for Cole. Since he’s still too young, and I’m pretending my movie is happening now, I have to go with model Thomas Vallmar. I think he could pull off a guy stuck between worlds, if only there was someone to free him! Kamijo is the lead singer for the bands Lareine and Versailles, but if he wanted to act, I’d be THRILLED to have him play The Magician in my movie. He’s a great performer and he’s got the right look. I think he would do a great job. Like a twisted Alice In Wonderland, can you imagine him as a confident, dangerous, mysterious and slightly disturbed mad hatter? I can! Clinton Moxam would be great in the role of Dane. Dane is a fierce friend and ally. He sees things as right or wrong, black or white and he’s not much for compromise. Once his mind is made up, heaven help anyone who gets in his way. Dane has a soft spot for a select few and is loyal to them. His downfall may be his many superstitions. Sasha Pieterse could easily play Raven’s feisty best friend Maggie. She knows her own mind and speaks it, never mind that her enthusiasm and wacky ideas may not be the help her friends need. Gage Golightly is a good likeness for Rosamond in The Paladins. Golightly is such a versatile actress, she can play someone shy and sweet, or the perfect mean girl. Since Rosamond mood swings tend to keep people guessing, Gage is the perfect person to fill the role. I love cast lists…and now I can’t wait to read this book. Join me in adding it to your TBR list on Goodreads! Check out more on Julie’s Website, Twitter, or Facebook page. And don’t forget to enter the contest for a chance to win a ton of signed books by me and many more! Just check out all these books on TEAM RED. To enter, you need to write down my favorite number which is and find all the other numbers on TEAM RED, add them up, and you’ll have the secret code to enter for the grand prize! While you’re here don’t forget to enter the Rafflecopter BONUS contest! Autographed copies of The FALL of GRACE and DIE FOR YOU. ONE winner will receive an autographed copy of The FALL of GRACE and a $25 GIFT CERTIFICATE. Ready to move on to the next link in the hunt? Head over to visit author Paula Stokes. Tashia Jennings Thank you for this truly remarkable chance! Emily OMalley Good Luck to everyone! My TBR keeps getting longer!! Julie Holden Fave number is showing as a broken pic symbol... Is the contest over?